Back in 2009, I was submitting a paper on artificial intelligence with my PhD advisor. We found a journal called Computational Intelligence, whose then Impact Factor was above 5 (see Appendix: How high IF 5 is in AI?). 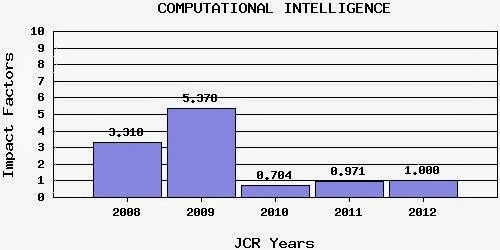 According to Thomson Reuter's Journal Citation Report, this journal was the No.1 in the category "Computer Science, Artificial Intelligence." So we submitted to this journal and it was accepted and published. I was so happy and told my mom "I published a paper on a top AI journal." The next year (2010), the Impact Factor of this journal drastically dropped to 0.704. I felt this was the end of the world. How can I use such a paper to find a faculty position? For a random reason, I checked its Impact Factor today. Now it's exactly 1.000. The figure below visualizes the Impact Factor trend of this journal over the past 5 years. Sometimes I think that Impact Factor of a journal is a joke. Appendix: How high IF 5 is in AI? So, an Impact Factor of 5 is pretty high in the field of AI, or literally "Computer Science, Artificial Intelligence" category.